One of the most significant events in the history of the island is undoubtedly the sale of this land to a private company. This is certainly not a light heart that the nuns have taken this decision. They had experienced many difficulties since the beginning of the century and they have only become worse with the approach of the 50s. Among the problems they have experienced include large floods, vandalism, theft and even labor disputes with employees. Do not forget that if the island could have great value for a property investor, it was uneconomic for anyone who ran for educational and agricultural. Various government projects had been planned for the island, but they have not materialized. 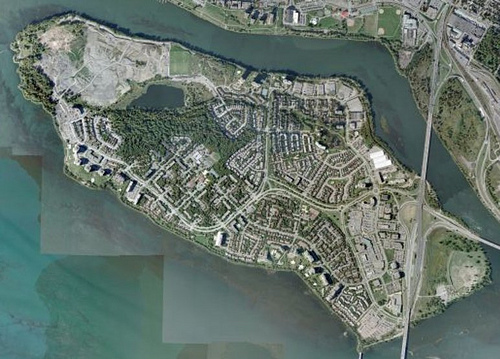 It order to achieve a major residential project that the island was acquired by the company “Home and Mortgage Quebec. The sales contract, signed in January 1956, reported a price of $ 1 300 000 and various conditions were attached. Without specifying all the elements, we can say that the sisters insisted that the island is not transformed into “amusement parks”; its development should be for residential, commercial and industrial. For the investor plans to materialize, it was essential that the island is connected to the mainland and is incorporated into a municipal entity. Separated from Verdun by an arm of water just a few hundred meters, so it is with this city that steps for annexation have been undertaken even before the acquisition of the island. The city of Montreal showed, too, interested, but eventually Verdun which annexed the territory of the island. The various incidents that have marked these discussions and negotiations are described in great detail in the book Jacques Lacoursière (L’ile-des-Soeurs – From yesterday to today). In the archives of newspapers Transcontinental Group (which includes the magazine) there is also extensive information on early history of the island during this period and throughout the last century. To complete this portion of its records, the author of these lines has obtained the cooperation of Samuel Gewurz, President of the corporation Proment which, as we know, is very active in the development of L’Île-des-Soeurs . Samuel Gewurz was only 15 when his father signed with other representatives of Quebec Home and Mortgage, the purchase agreement of St. Paul Island. The future holds a leading role in the evolution of the island, but before he begins to exercise, the initial plans had been repeatedly modified. When, in 1967, they proceeded to the first shovelful of earth on the “City of Dreams’, is a company headquartered in Chicago, Metropolitan Structures Incorporated (SMI) was” tenant “of the island whole. She had obtained a leasehold for a term of 99 years, which was, according to Samuel Gewurz, a real “developer’s deal. SMI obtained the privilege of not paying a penny in rent during the first ten years of the agreement and it enjoyed protection against inflation for a period of 45 years. The company must however pay the full taxes on the property (the whole island) and, from the eleventh year of the lease, pay an annual rent of 7.18 cents per square foot net for the developed portion of the island. In the years before the construction of the first building, the remaining obstacles to the development of the island had been removed. The Champlain Bridge was completed in 1962 and measures had been taken to ensure the extension of public services to future residents.